I use date paste a lot in my recipes to replace sugar. I thought I would make a separate post for the recipe so that from here forward, every time I make something using it, I can just reference this post rather than writing out the whole process of making it each time. Soak dates in 1 cup of water for 10-15 minutes. Drain, reserving 1/2 cup liquid. 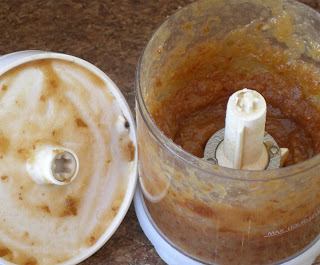 Place dates & 1/2 cup liquid in food processor and blend until a paste is formed. You can use date paste in a wide variety of ways. It can replace oil or sugar in cookies, cake, muffins, etc., or you can use it as the base for your own healthy snack bars. Do some research and have fun making your favorite treats healthier by using this substitution in place of other, less nutritious ingredients.